We are delighted to announce the publication of a comprehensive online index to Terry Bennett’s acclaimed series. 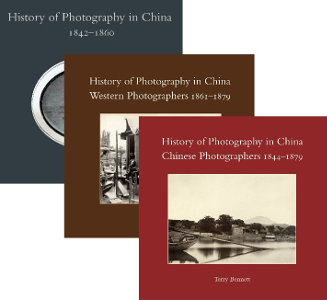 This free resource gives countless new routes into the three detailed histories of the early years of photography in China, published by Bernard Quaritch Ltd between 2009 and 2013. View the index here. The first volume in this ground-breaking series focuses on the earliest years of photography in China and the second with Western photographers working in China in the 1860s and 1870s. The final volume is the first extensive survey of early Chinese photographers up to 1879. More information about each book can be found here. To celebrate the index’s release, the postage charge for each volume in the series has been reduced to just £1 when you order direct from us. This offer runs until Monday 5 June 2017.